Children with intellectual disabilities (which may include Down syndrome, Fragile X syndrome, and other cognitive delays or disabilities) need physical activity just as their typically developing peers do. Sports can help build kids' confidence and help them get to know other kids in the community (and vice versa). In kids with Down syndrome, in particular, cardiovascular fitness is critical to improved health. Teens who have Down syndrome are two to three times more likely to be obese than their peers without Down syndrome. 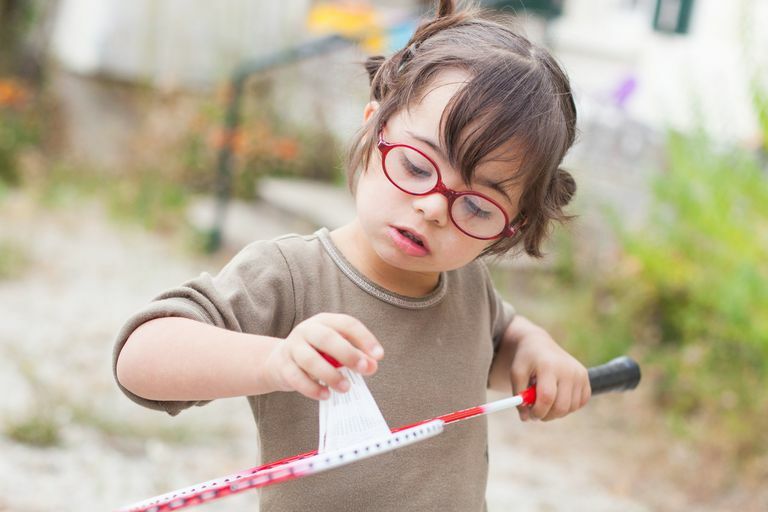 Kids with Down syndrome can face challenges that can make exercise more difficult, such as poor eyesight and balance, low muscle tone, and hyper-flexibility. Between 10 and 20 percent of people with Down syndrome have atlantoaxial instability or AAI, a misalignment of two vertebrae in the neck. This condition is diagnosed by a screening x-ray. Doctors may recommend some exercise restrictions in people with AAI because of the risk of spinal cord injury. Walking, jogging, riding a stationary bike, horseback riding, and low-impact dance are all recommended for kids with intellectual disabilities. But there are many, many more sports and types of exercise that could work, depending on a kid's interest and abilities. Special Olympics—a sports program devoted to people with intellectual disabilities—offers more than 32 options for individual and team sports. Kids can play for fun and to learn new skills, and also to compete with peers in their hometowns and around the world. For safe and successful sports participation, your child should have a doctor's permission before she tries something new. Teachers and coaches should be patient and offer lots of demonstrations (showing instead of telling) and encouragement since it can be hard for kids with intellectual disabilities to learn new skills right away. Having your child exercise with a buddy is often motivating. So is recording progress on a chart so she can see her improvements. Check with your child's doctors, teachers, and therapists and ask them to suggest exercises and activities you can do at home. You can also ask your child's team, as well as fellow parents of kids with special needs, about sports leagues and other programs to try. This advice on matching your child with the right sport applies to any kid. You can also follow the links below to sports programs and leagues designed especially for children with special needs. For more options and resources, try The National Center for Physical Activity and Disability, which has a searchable listing of hundreds of adaptive sports programs and camps (tennis, fishing, SCUBA and lots more). Bryl W, Matuszak K, Hoffmann K. Physical activity of children and adolescents with intellectual disabilities - a public health problem. Hygeia Public Health. 2013;48(1):1-5. Finding Balance: Obesity and Children with Special Needs. AbilityPath.org, November 2011. Rimmer JH, Yamaki KK, Lowry B, Wang EE, Vogel L. Obesity and obesity-related secondary conditions in adolescents with intellectual/developmental disabilities. Journal of Intellectual Disability Research. 2010;54(9).